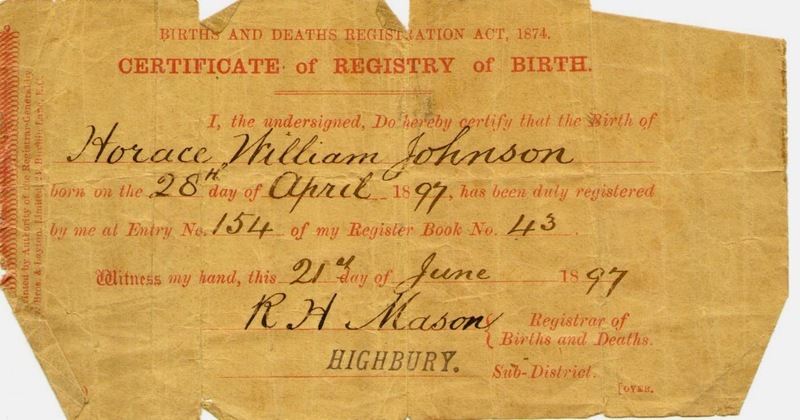 Do you remember what first motivated you to start researching your family history? When I was twenty, maybe twenty-one, my grandmother showed me the contents of a special brown case, which I now know was one of a matching pair her parents brought from London when they migrated after WWI. The case was full. Photos, letters, postcards, documents, an autograph book and other exciting things. She told me stories to match some of the memorabilia and, as much as it makes me cringe now to say so, I wasn’t ready to listen. She tried sharing stories a few times, and while I do recall a few tidbits – her father was a plumber (which helped me in a big way to find the right Johnsons in London censuses), the autograph book was signed by her friends at the end of WWII (and her father, who drew the cute little pictures), her mother kept in contact with relatives back home – mostly I didn’t listen. After my grandmother passed away, and my brothers, my mother and I cleaned out her place, we found the contents of the case. Only they were no longer held in the case, but a biscuit tin. Yes, a biscuit tin. Something about ten percent of the size of the case, perhaps less and, while the tin was completely full, it was obviously not the entire collection of photos, documents and so on that she’d tried to show me so many years before. I often wonder what else was in that case. What she threw away and why she chose one thing over another and, while it would be excellent to have been left with all of what she originally had, in some ways, I know I shouldn’t complain, as there were certainly a good handful of treasures, including her father’s birth certificate – from 1897! – her parents’ original marriage certificate, their WWI service documents, postcards sent to her mother, her husband’s birth certificate, and the autograph book. Though it wasn’t when I sat with my mother going through the contents of the biscuit tin that I was inspired to start researching. It was still a few years off. I don’t remember exactly how it happened – and he remembers it differently – but it was my son who motivated me. I can’t recall the question itself, but he asked me something about my grandfather. The grandfather I’d never met and knew almost nothing about. Aside from wanting to be able to answer his question, suddenly I was curious. I called my mum, though she didn’t know the answer. She knew barely more than I did about her father, though she did know my brother had copied the details from his birth certificate and also that that same certificate was somewhere in her mother’s things. No, she didn’t feel like rummaging through everything – one biscuit tin! – to find it for me and even if she didn’t, she certainly wasn’t going to post it. I’d moved to Brisbane only a couple of months before – from Melbourne – and she would let me have the certificate – and everything else – but only if I came to Melbourne to collect it myself. Which led to me finding other ways to find out what I wanted to know. By the time I’d got all the details from my brother, I was hooked. Probably from the moment he read out my great-grandmother’s long name, or the list of my grandfather’s siblings. As soon as these people had names, I just had to know more. 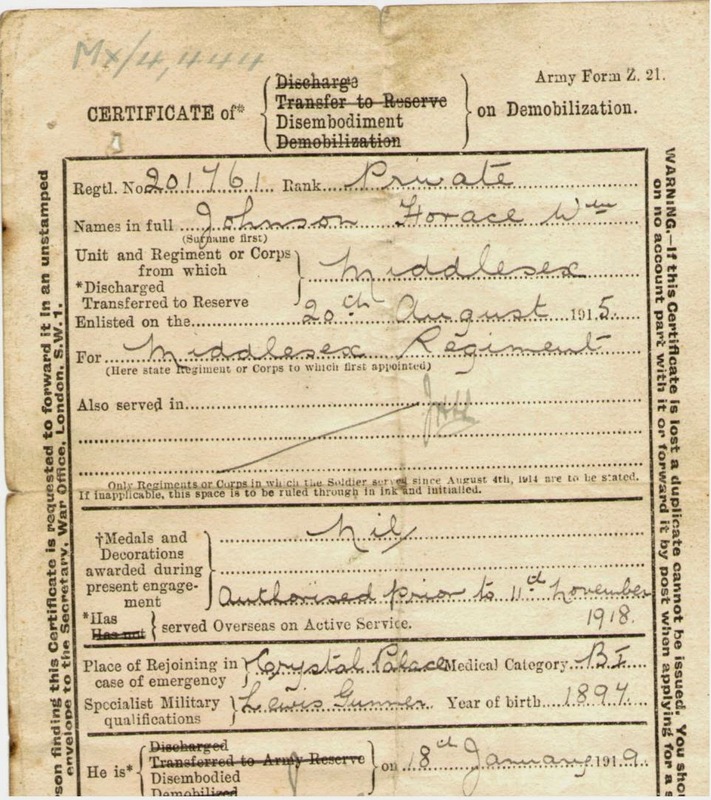 The first document I ordered – before travelling back to Melbourne to get my hands on that biscuit tin and its contents – was my grandfather’s WWII service record. Now, when I have slow periods of little research, when I’ve been too busy with other things, I come back to that service record – or at least to my grandfather – to recapture some of that early inspiration, to remind me where my search began. Do you remember what first inspired you? What first inspired me was attending my dad's funeral in 1987 and realising that there were only 2 close family members left in England who had been there before I came to Australia – my mum and my brother. Who were all those people I remembered from my childhood? I subsequently discovered that I'd only ever met relatives from my grandmother's side of the family. I still wonder why and whether I'll ever find out. I'm trying to gather as much information as I can from my mum about her side of the family while she's still around. I hope you find some of those answers Pauline. It sounds like an interesting story lurking in there. Just as your mother did, my mother often told us things and pointed out places of family relevance, but I was only interested in the 'here and now' – until I had my baby on my lap. A sudden compelling urge to bring her to God and find out where she came from took possession of me. My mother was happy to help me fill in Family Group Sheets (which I bought from GSQ in the old Post Office at Woolloongabba) which are a blessing now, but try as I might, I could not capture any family stories. As soon as I started jotting them down, she would already be heading off at a tangent reliving wonderful memories that were too ethereal to pin down; all I managed to capture were a few disjointed words and phrases. However, she and my father left a treasure trove of memorabilia in the house, and it was when I assembled two display books of old photos for a reunion at a cousin's house that THE BUG bit. I have been interested in my family history since I was 12 years old. While my mother's side told their stories really well, and I soaked up every detail I could, my father's response to my questions went a little something like "What do you know about your family history?" "Nuthin'!" "Where did your family come from?" "Germany." "What were your grandparents names?" "Dunno." It is only in the last five years that I have discovered Swiss, Scottish and Irish ancestry and a whole new world has opened up! Haha Lyndall, your father's answers sound very familiar. My mother often says 'dunno' and 'nuthin' when I ask her stuff, though I've found a way to sometimes get smaller details from her. You've done a great job to discover all that Swiss, Scottish and Irish ancestry. Thanks for sharing. Thanks for stopping by Anonymous. Those family stories your mother tried to share sound 'just' out of reach as she went off on tangents. So frustrating, but maybe you've found, or will find, some of those stories through your research anyway. Those display books sound great, and an excellent way to start.